Noir is inaccurate. THE BIG SLEEP is included in noir collections because it is tough and has low life characters. An all rocker shocker said the posters in the beginning. More important, critics find it impossible to resist. But really it is hardboiled crime. There is a difference. Noir is doom laden. Morality is beyond the tragic hero but, even if he was capable, existence will render decent aspiration irrelevant. Morality does not provide immunity from tragedy. Not when caprice, death and treacherous females await. Hardboiled also has females that cannot be trusted but the hero either finds an exception or he is beyond their reach. A detective is a detective in hardboiled. In noir a detective is a man who will be ruined by slim ankles, tall hair and a smile that is beyond his understanding. These are the words of Cornell Woolrich, the Marcel Proust of Noir. First you dream then you die. But hardboiled and noir share some characteristics. If the females do not destroy, they will deceive and injure. THE BIG SLEEP has plenty of females. Indeed, the murder that makes the plot complicated is committed by crazy Carmen Sternwood. But, at the end of the film, Carmen is committed to a mental hospital. Marlowe and Vivian will live together happily. They will age and swap wisecracks and down Martinis. Girlfriends in noir either triumph or die alongside the wrecked male hero. The women in THE BIG SLEEP are sweet eye candy that will offer diversion or tough talkers that Marlowe will deem worthy of lighting his cigarettes. The sexiest women in THE BIG SLEEP work in bookshops. Nothing in cinema beats Dorothy Malone closing the window-blind with her backside, especially when we realise she is still wearing her pince-nez glasses. But Marlowe picks Bacall to light his cigarettes. She is the tough talking independent minded woman the moral detective wants at his side. Hardboiled crime may have tough elements but the woman who captures the heart of the detective will be his shield against a corrupt world. Noir is much more dangerous. There are no shields from fate and despair in noir, and the women are deadly. The tough talking females in THE BIG SLEEP, though, provide the common ground, Hemingway without the existentialism. 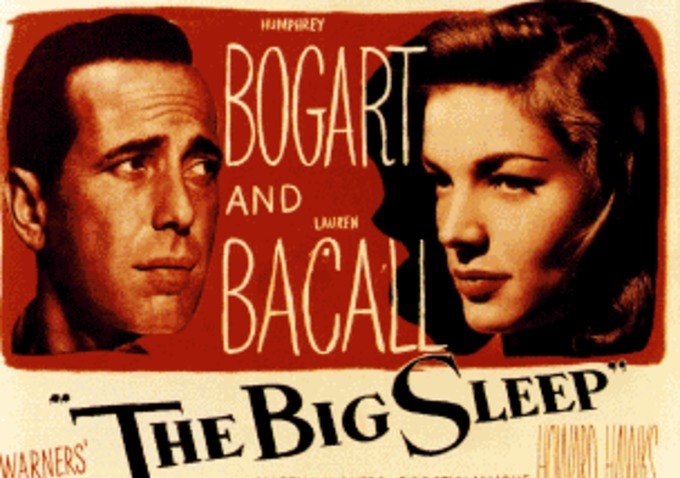 The triumph of THE BIG SLEEP is how it combines Hemingway with an adolescent need for glamour. Marlowe not only pulls women better than Elvis, he always has the last word. The seeker of the Holy Grail that inspired Raymond Chandler does not exist in the movie. Bogart may talk tough guy morality but we all know his real purpose. Like Elvis at his best, he is simply cool and the fantasy is that, if you are cool enough, the world will just have to stay still and admire. For Elvis and Bogart perhaps it did but for the rest of us the reality is more close to the tragedy of noir. First you dream then you die. Posted in Film, Film Noir, Reviews and tagged cinema, crime, film, film noir, movies, The Big Sleep on March 22, 2014 by Howard Jackson.